After the infamous '99 nightclub shooting for which Shyne was convicted of aggravated assault, P.Diddy searched for a new act with "no jail, no guns, no drama." He basically wanted some good boys for Bad Boy. Enter the Hoddfellas. At Puff's Hamptons Bash last year, the group's manager Marma Lil' slipped Puff a tape of Morock, Poppa Sim, Freddy Blassy and Verse- four schoolboys with clean records and clean lungs ( they dont even smoke)- spitting their self-titled anthem "Hoodfellas". Puff heard a commercial bonanza. After all, the boys have rap covered: Morock got the streets, Verse's got the freestyle fanatics, Blassy has the ladies and Sim is self describe universal. Ranging from age 17 to 22, the quadruplet call themselvers social advisors to the 31 year old Puffy. "He couldn't go to the streets so he came to the hood." Blassy announces. The hoodfellas keep the CEO in touch with the hood by doing everything from picking out clothes to introducing him to new dances ( like the "shoulder shake" Puff unveiled in G-dep's Let's get it video) to writing his rhymes. Though Morock, the eldest Hoodfella and designated ghostwriter, won't specify what records he's written, he will admit Puff's a demanding perfectionist who's "been rhyming better than ever". 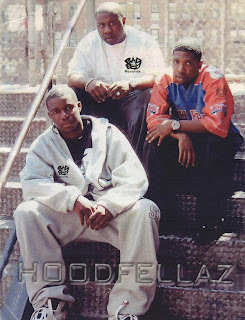 You can hear the men behind Puff's music on the upcoming Badboy Compilation, The Saga Continues...Carl thomas's "emotional"remix and the Hoodfellas debut, which will be released this fall on Big thingz, the label run by Hitmen Yogi (Morock and Blassy's cousin) and distributed by Badboy. Inside the Village's Time Cafe, the Hoodfellas are refreshingly playful and polite; a far cry rom rap's typical ice-grills thugs. Morock, Blassy and SIm grew up together in Bed Stuy, but they kid fraternally with the quiet, flute and piano playing Verse who Marma Lil' recruited from Harlem for his infallible freestyle skills(which he demonstrated at the table, rhyming about dinner.) The Hoodfellas have their own lingo, in which good sis "hood" and profanity is rare. Though he acknowledges they're not choir boys,Sim says, " We know if we in jail we can't get money- that's motivation for us." and that's all Hood.